Nancy Pelosi is facing a new problem: an erosion of support from progressives who have long flocked to her side. Rashida Tlaib, the Michigan Democrat all but certain to become one of the first Muslim women to win election to Congress, suggested last week that she'll oppose Pelosi's bid to remain atop the party. For Tlaib, 42, the concern is not so much ideological as it is generational - a fact that highlights the hunger among a younger crop of Democrats for a changing of the guard atop the party. She and like-minded candidates are running as Washington outsiders - and vowing to shake up Capitol Hill. [post_ads]Jahana Hayes, a liberal who won Tuesday's primary race to replace outgoing Democratic Rep. Elizabeth Esty in Connecticut, has also said she'll oppose Pelosi as party leader. Andrew Janz, a labor-backed Californian vying to unseat Rep. Devin Nunes (R), and Jared Golden, a Medicare-for-all proponent challenging GOP Rep. Bruce Poliquin in Maine, are vowing the same. And Kara Eastman, the progressive candidate who toppled former Rep. Brad Ashford (D) in this year's Nebraska primary, also wants a top-down reshuffling. "I believe it's time to bring fresh perspectives to Washington," Eastman said amid the primary race. Pelosi, who has vowed to remain the Democratic leader next year, insists that talk of leadership races is premature. She's criss-crossing the country to campaign and fundraise for Democrats with a laser focus on winning back the House after eight years in the minority wilderness. Conversations about next year's leaders, she says, are best left for after the midterm dust has settled. "I haven`t asked a candidate or an incumbent for a vote," Pelosi said Sunday on MSNBC's "AM Joy" program. "What`s important - and I know better than anybody how important it is - [is] for us to win this election because I see up close and personal what the Republicans and this president are doing." Pelosi (Calif.) is accustomed to criticism from moderate lawmakers within the Democratic ranks. Several members of the conservative-leaning Blue Dogs have habitually voted against her in leadership contests. Rep. Tim Ryan, an Ohio Democrat, challenged Pelosi for the top spot in 2016, arguing that the party has lost touch with heartland voters under her long reign. But Pelosi, the Democratic leader since 2003, has always enjoyed widespread support from the liberals who've rallied around her. She beat back Ryan's challenge in a lopsided 134-63 vote within the progressive-heavy caucus, and she's now vowing to flip the House in November and recover the Speaker's gavel she lost in a 2010 wave. Pelosi's path will be steeper, however, if the liberal base she's always attracted begins to drift away. 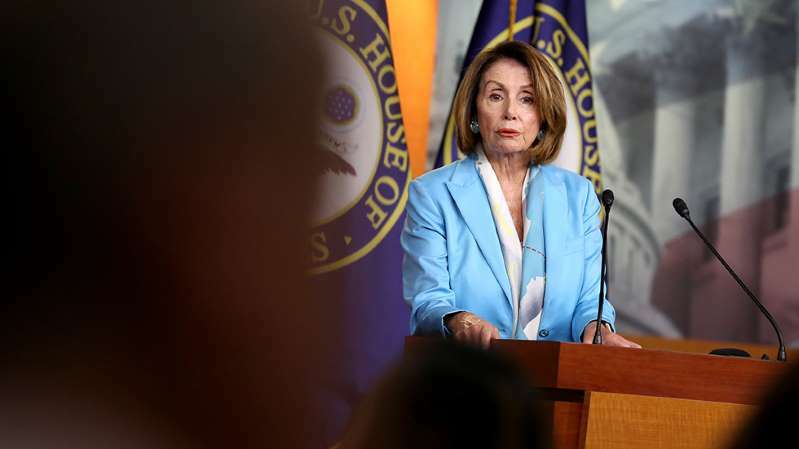 Among the candidates Pelosi is stumping for are a number of liberal would-be freshman who have voiced their support for the long-time Democratic leader, including Debra Haaland in New Mexico, Jesus "Chuy" Garcia in Illinois and Sylvia Garcia in Texas. Winning back the House would eliminate a central criticism lodged against Pelosi: namely, that the party simply can't regain the majority with her at the helm. And a former Democratic leadership aide said Pelosi's liberal detractors are simply tapping into the country's current anti-establishment environment to gain political leverage when they get to Washington - a sentiment that could change after they arrive. "They're attacking Congress in general. They're just not happy with anything that anyone is doing," the former aide said. "Everyone's trying to say, 'Well, I'm gonna keep my powder dry until we get there, because ... if I do that, then I could get something for it.' It's all politics at the end of the day. "If it's generational then how come Bernie Sanders is the leader [of the progressive movement]?" Still, dozens of Democratic hopefuls around the country have either vowed to oppose Pelosi as party leader or refused to commit their support. And while most of those are moderate candidates in conservative-leaning districts who are staking out an anti-Pelosi position as a survival technique, others are staunch progressives from deep blue regions - like Tlaib and Hayes - who all but assured victory in November. Among those who have so-far withheld their support is Alexandria Ocasio-Cortez, the far-left candidate who stunned the party in June when she picked off Rep. Joseph Crowley (N.Y.), the Democratic Caucus chairman, in their New York primary race. Ocasio-Cortez, a self-described Democratic socialist who helped Sanders on the 2016 presidential trail, has criticized the party brass for not fighting fiercely enough for liberal ideals. "I've got to win my race first, but we've got to take a look at what's going on," Ocasio-Cortez told CNN last week. Both Rep. Michael Capuano (D-Mass.) and his primary challenger, Ayanna Pressley, have also declined to endorse Pelosi heading into the Sept. 4 contest. Any opposition could complicate Pelosi's leadership bid next year. The Democrats need to pick up 23 Republican-held seats to take back the lower chamber, but it remains highly speculative whether Pelosi could subsequently win the 218 votes needed to regain the Speaker's gavel with such a slim margin. A few centrist incumbents have historically rejected Pelosi in the Speaker's vote on the House floor. And additional opposition from new arrivals would mean she may need a larger cushion to secure the gavel heading into a crucial 2020 presidential cycle. To lend Democrats more time to process the midterm outcome, the caucus voted last month to delay their leadership votes until December. The Republicans have, for years, gone after Democratic candidates by tying them directly to Pelosi, who is a radioactive figure in many conservative parts of the country. But the tactic has escalated this year with President Trump joining those attacks and the Republicans at risk of losing their majority. The strategy at once energizes the Republican base and further divides Democrats who've been grumbling for years about the leadership bottleneck at the top of the party. Yet the ultimate effectiveness of that strategy remains uncertain. Rep. Conor Lamb (D), targeted with such attacks, was able to eke out a win earlier this year in deep-red Pennsylvania. And a CNN poll released Wednesday suggests the GOP's focus on Pelosi will be a flop, finding that 34 percent of voters deem Pelosi a significant factor in picking candidates - at the very bottom of the list of 10 issues on voters' minds. By contrast, more than 80 percent said health care and the economy will be an "extremely" or "very important" influence over their vote; and 68 percent put Trump in those categories. "It's PR 101," said the former Democratic aide. "You distract and you just keep distracting in order not to answer any questions voters really want to hear about." Pelosi, for her part, says the campaign against her is evidence that Republicans, divided over their mercurial ally in the White House and the many scandals dogging his administration, have nothing else to run on. She's warning her troops not to allow GOP campaign strategists to dictate the leadership future of the Democrats. "I do not think our opponents should select the leaders of our party," she told MSNBC Sunday. "The Republicans are spending millions - tens of millions of dollars - against me because they`re afraid of me, because I outraise them in the political arena, because I outsmart them at the negotiating table and because I`m a woman who`s going to have a seat at that table."